Smart status is no longer restricted to our phones—homes are getting smart, too. Advances in technology now allow us greater systems control and accessibility, increased safety, and oftentimes enhanced energy efficiency, all from our phone or tablet. 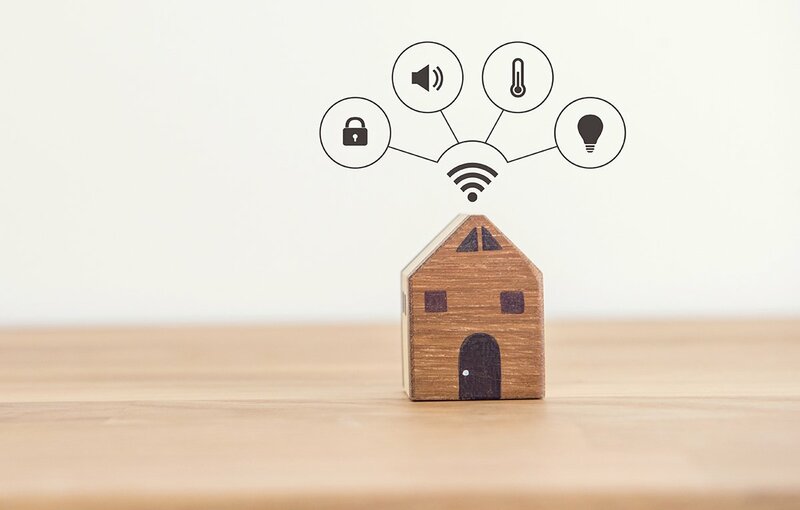 Here we provide a quick and easy overview of some of the most popular options for using technology to help monitor, regulate, and customize your home. We are used to coffee makers that can roast, grind, and brew on demand. Now, while sipping our morning brew, we can peruse the inside of the refrigerator and freezer without opening the doors. Special LED screens allow full visibility of all components inside and streamline the process of making grocery lists. The touchscreen allows you to create lists, and even shop! Write a quick note to the kids, or a home to-do list for the week. Voice technology is making it easier to connect with the media you love. When relaxing at the end of the day, just talk to your TV in order to find and play your favorite movie, or ask your smart speaker for music options that match your current preferences. The field of home protection is full of the very latest and greatest technologies. Intercom systems can be easily installed throughout the house that can be controlled in rooms and also by smartphones. A variety of security systems record activity inside and outside the house, as well as throughout the lawn, garage, and property. Smart doorbells can allow you to see who is at your door without opening it. Cameras can record and livestream data to your devices 24/7. And smart locks can lock/unlock your doors remotely, as well as provide information about who is coming and going. A benefit of smart devices is that they allow us to go greener and use energy much more efficiently on a daily basis. Climate control is available for HVACs and central air systems, which means that the house can tell when your family is at home or away, and set the temperature accordingly. Additionally, special window coverings can be set to raise and lower automatically, to let in or block out sunlight at key times of day. And specially-treated window glass can now tint itself on sunny days and adjust visibility levels based upon weather conditions and your family’s preferences. For a more comprehensive overview of this growing field, and other emerging technological categories, check out the Smart Home website. Homes are getting smarter by the day, and you can take advantage of that technology to enhance your life! At Meridian Ranch, our community builders are committed to being as smart as possible in designing sustainable, personalized homes for our residents. Want to learn more? Sign up on our Interest List to find out more information about upcoming builds, new designs, and our events!